Every single year for the past 7 years I have been on buying trips through Europe and Asia finding all the coolest latest gadgets for my clients. With international client's all over the world it has meant that that I generally need to be on a plane and in front of them presenting all these cool new items. Some years I was flying from London to San Francisco every single quarter to sync with the Google marketing team and ensure we had the latest gadgets, coolest apparel and quirkiest products to reflect the Google image. Once the items were approved, I'd then be jetting off to all the various large Google offices around the world (Zurich, Hamburg, Milan, Paris, Belgium, Dublin, etc) to sync up with their marketing teams too. We take our Environmental impacts very seriously, and so do our clients. That is why we invested in getting something done and remove our carbon footprint. While ISO14001: 2004 Environmental Certification assures our customers and supply chain of the drive for continuous improvement, we will always strive to go that little bit further. We’re continually working on reducing our impacts and so we figured, let’s do something to remove the lot! 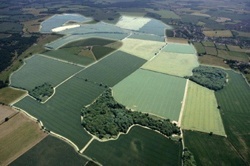 We are removing some of our greenhouse gas emissions by helping the Woodland Trust through its Woodland Carbon project, creating half an acre of new native woodland in the Heartwood Forest, UK – enough to remove at least 75 tonnes of CO2, equal to our current carbon footprint. This is part of a strategic programme to reduce emissions wherever possible. And we will be doing the same next year for our 2012 footprint.